This is unfortunately our last week and for some unknown reason we have seen a lot of jellyfish. The jellyfish have come from out of nowhere and the kids are enjoying them. I don't like the jellyfish because they're slimy and feel nasty. 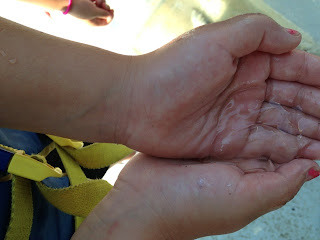 The kids love the jellyfish so much they have forgotten about the crabs. Just kidding, the crabs will never be forgotten, because our whole summer was based mainly around catching them. The kids are sad that this is our last week, but they have been enjoying themselves. They wish that summer was longer so they could stay here. I'm really sad that we are leaving these kids and can't wait for next year. 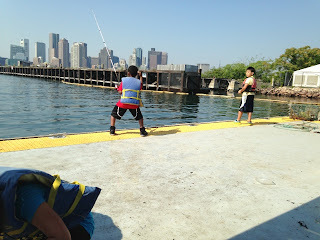 I hope to come back to Save the Harbor next year and help improve on everything so that the kids can enjoy themselves even more. Casting competition between Isaiah and Chanu.